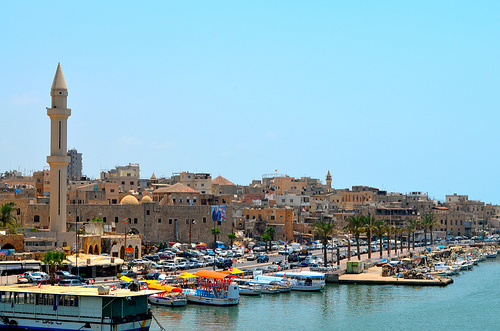 Saida, or Sidon as it is more commonly known, is a port city some 30 miles away from Lebanon’s capital, Beirut. Its name derives from its earliest incarnation as a fishing village. From this humble history, it has grown to become the commerce hub in this southern part of the country. Its centuries-old souqs (local markets/ bazaars) are a local highlight and are a key part of the city’s history. It is in this bustling city of business that we find Jamila. Jamila is a native Sidonian who has made a life in the city as a wife, mother of four children and an artisan of local handicrafts. She wakes up every day to make breakfast for her family and ensure that everyone off to work and school on time. Once her family is out the door, she goes into her workshop and begins her work of designing and creating a number of different kinds of jewelry and accessories. She sells her handcrafted pieces to two local stores and with these profits she is able to pay for all her children’s school fees and contribute a substantial amount to meet their household expenses. Like many low-income women entrepreneurs, being a business woman was something she fell into. Although she is a maker at heart, crafting pieces here and there for friends and family, she was only selling one or two pieces opportunistically. It was only in 2008 that Jamila took her inherent skill and interest in creating accessories and brought it out into the marketplace. With a seed group loan of USD 100 from Women’s World Banking network member Al Majmoua, she was able to craft enough pieces to participate in the South Lebanon Fair. It was breakout moment for Jamila—she ended the day with LBP 100,000 (USD 67) in her pocket… almost enough to repay her first loan! But she knew this was only the beginning. Jamila took advantage of the non-financial services also on offer from Al Majmoua: in 2009, she took a chocolate design training session which taught her new techniques and honed her handicraft design skills. At the end of 2013, Jamila became eligible for an individual loan and received USD 1,500 from Al Majmoua which she invested in purchasing bulk raw materials to increase her profit per piece. Jamila sees a future where she is not only creating the goods, but also selling them herself in a store that she would own and manage with one of her children. 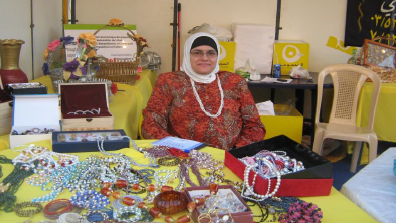 For now, this entrepreneurial artisan is content to design and create beautiful handcrafted jewelry that supports her family, knowing that Al Majmoua is there for her to help continue her success as a microentrepreneur.